Alma Mater: "Hail, Montezuma / We with loyal hearts our homage pay . . . "
Aztec Football Traditions / Aztec Spirit: Visit the SDSU Athletics site to learn about Aztec Traditions and Spirit, and Aztec Football Game Day. Convocation: Just as commencement is a ritual marking the completion of study, convocation signals the beginning of a college career. The event begins with Band Run, led by the SDSU Marching Band and Cheerleaders. Greek Week: Greek Week is one of SDSU’s largest student-run events. 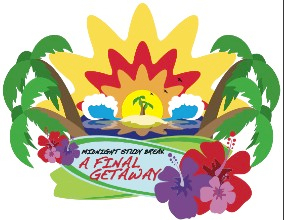 Members from each fraternity and sorority work together to creaste 6 days of fun and excitement. 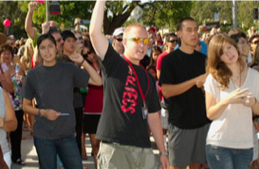 Events include attending an Aztec Baseball game, Carnival Day (games, food, Greek Olympic-style games, hands-on service and All Greek Award Ceremonies. The most exciting day of Greek Week is the Talent Show. This event is a spectacular show of talent combining acting, dancing, costuming and prop design to create a professional and entertaining production. Proceeds from the week are donated to a designated community service organization. History: SDSU began in 1897 as San Diego Normal School in a group of temporary downtown offices. There were 7 faculty members and 91 students, and the school was designed to train teachers. The first graduating class of 1900 consisted of 23 women and 3 men. The school moved to its first permanent location on Normal Street in 1902. It became San Diego Teachers College in 1921 and also changed from a 2-year prep program to a full 4-year institution. The school moved to its present site in 1931. The name Aztec was first used in reference to athletic teams in 1925 but did not become official until 1937. By 1964, San Diego State had taken over 300 acres and had a student population of 15,000, which would double by 1974. As the 20th century came to a close, the campus has continued to grow. To learn more, see the SDSU History website, or visit the Love Library Special Collections and University Archives. University Archives holds materials which document the history of San Diego State since its founding in 1897. University Archives provides source material and articles about SDSU history for the series “Decades Ago at San Diego State" disseminated by the SDSU NewsCenter. Homecoming: Each fall, thousands participate in our annual tradition of welcoming alumni back to SDSU, with festivities including a football game, student competitions, and music provided by the SDSU marching band. Student leaders are nominated each year by their respective student organizations to be selected for the Homecoming Court. Teams of students compete during Homecoming Spirit week to win prizes, including the coveted Homecoming Spirit Trophy, and recognition at the Homecoming Football Game during half time! Midnight Study Break: Takes place during finals week at the end of the semester, each fall and spring. With free breakfast, study tips, door prizes, and more, it provides a perfect way for students to take a rest from cramming for finals. SDSU faculty, staff and volunteers give out test-taking tips and serve free, hot food to all students! Learn more at the Aztec Nights website. Red and Black (SDSU school colors): Learn about SDSU's red and black holiday. Red and Black Welcome Back Dance: A night of dancing, entertainment, and free food! This is an annual fall semester event, part of Aztec Nights. SDSU Fight Song: "Hail to our team / San Diego Aztecs fight!" SDSU Month: Each March, SDSU Month features 31 days of artistic, academic and athletic events, special offers from local businesses and a partner-supported media campaign to raise awareness of SDSU’s outstanding people and programs. Templo del Sol: An annual initiation for new Aztecs, this event is part of Aztec Nights. 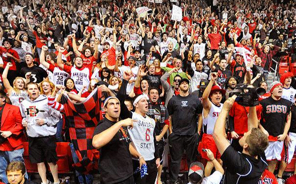 The Show: This is the San Diego State Aztecs basketball student section at Viejas Arena. They're well known for being creative and loud in their support of Aztec basketball. 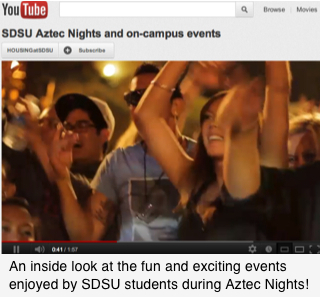 Welcome Week: The first week of each fall and spring semester is SDSU Welcome Week. More than 95% of new Aztecs participate in Welcome Week activities including the Aztec Bash BBQ and student involvement activities. Make sure you are there! See video and catch the excitement of the annual Band Run, part of Convocation ceremonies at SDSU! Watch YouTube video of "I Believe That We Will Win" chant by The SHOW! This is the 6-foot, life-size statue of Samuel T. Black, an immigrant from Scotland who became SDSU's first President. Look closely, and you'll see that his left foot is a bit rusted and tarnished. This is because students traditionally rub his foot for good luck. It's not uncommon to see students walk by and give the foot a quick rub — especially during midterm and finals weeks. Need a little extra luck today? Go ahead and give it a try! This monument celebrates a century of SDSU history, pride and academic achievement. Constructed in 1997 to mark the university’s 100th anniversary, it features a collection of 100 stones gathered from within a 100-mile radius of campus.